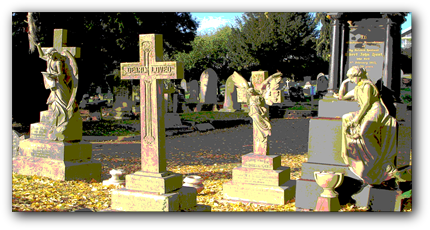 The Group was formed in September 2004 to protect, preserve and promote interest in this Victorian cemetery. The site covers 5.5 acres and was opened in May 1881. Although it is no longer possible to purchase a new grave Belgrave cemetery is still a working cemetery. There are 4505 burial plots. In the original construction a Chapel and a Keepers Lodge were included, regrettably the Chapel was demolished in the 1960s, the Keepers Lodge remains as a private dwelling. There are 48 Commonwealth war graves of men from both world wars whose remains are interred in the cemetery, and over 100 family memorials bear the names of men killed in action and buried in foreign war cemeteries. 2005 Four members of the group received "Community Service Volunteer" medals for commitment. 2006 Commemorated 125 years since the first burial at Belgrave Cemetery (Rosetta Getliffe). 2007 Published the book "Soldiers of Belgrave Remembered" with the aid of a Lottery grant. commemorate 149 Belgrave men who gave their lives in both world wars. 2009 Entered into the CSV "Make a Difference Day". 2010 Received grant from local benefactor for the restoration of KIA war graves. 2011 "Quiet Corner" constructed by group members at Belgrave Cemetery. 2012 Belgrave Cemetery Records CD launched, available via our books page. 2013 Published the book "Living Memories" available via our books page. 2013, 2014, 2015, 2016 Received the "Green Flag Award". We are also busy in applying for various grants, enabling us to restore KIA monuments (24 to date) which are monuments that bear the names of military casualties of both world wars who are not buried in Belgrave Cemetery, buy equipment needed to run the group, also holding annual "Open Days" and "Heritage Open Days" with conducted tours of the cemetery. We can help you with your family research please contact us.